Missing one or more teeth can impact the beauty of your smile as well as the function of your mouth, including impairing your ability to eat or speak. Dental implants from Saco River Dentistry can replace missing teeth with beautiful results and give you a smile you can be proud to show off. Our dentists are extensively trained in the planning and placement of dental implants, an advanced technique that’s considered the gold standard for addressing missing teeth. Comprised of titanium posts capped with dental crowns, dental implants are designed to mimic the look and feel of natural teeth while providing strength and durability. During your initial consultation, your dentist can help you determine if this is the right approach for your needs and goals, and they will customize your treatment plan to optimize your outcome and make your experience as pleasant as possible. Questions about dental implants? We can help. Contact our friendly and knowledgeable team to learn more about dental implants or other options for replacing missing teeth. Dental implants can be a great option for many patients, but they are not an ideal approach for everyone. It’s important to have sufficient jawbone structure to place the implants and ensure a secure, lasting fit. You should also be in good general health, although patients who suffer from gum disease are not necessarily disqualified—we will evaluate your needs and discuss your choices at your initial consultation. If for any reason dental implants are not right for you, we can help you identify another solution for your concerns. Patients can replace each missing tooth with an individual dental implant. This provides a strong, attractive restoration that works and looks just like the natural tooth. Individual implants can be used for one, several, or all missing teeth. If you are missing more than one tooth in a row, a dental bridge secured with dental implants can provide a stable and secure restoration that’s also beautiful. 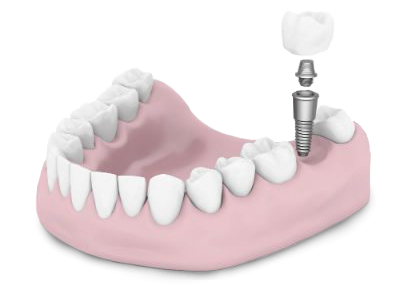 Many benefits come from using implants over traditional dental crowns alone, and we can review these during your first visit. Implant-supported dentures, also called implant-anchored dentures, are another option for patients who are dissatisfied with traditional removable dentures. These alternatives offer a better fit, greater prevention of jawbone loss, and easier maintenance than traditional dentures. The first step is determining if you’re a good candidate for dental implants. While this approach can be an excellent option for a wide range of patients, it’s not for everyone. It’s important for you to be in good general health and to have adequate jawbone density for dental implants to be a good choice. When you arrive for your first visit, your dentist will evaluate your teeth, gums, and other oral structures and discuss your options. After that, a treatment plan will be developed. Our dentists will determine precisely where to place the implants, which will be implanted through the gum tissue and secured to the jawbone for stability. The number of dental implants needed will depend on the number of teeth you’re missing and your unique treatment plan. Typically, each tooth gets a corresponding implant, unless you’re using an implant-supported denture, in which case four to six implants will be used to anchor the dental appliance. Our dentists will talk you through each step of the process, and we make every effort to provide you with the information you need to make the best decision for your oral health goals. Once the implants have been placed, the surrounding bone will need time to heal. This can take six to nine months, and while most patients report little discomfort, some patience will be necessary. Temporary dental crowns or a denture will be used during recovery, so you will never be without your smile. Once healed, permanent dental crowns will be affixed to the top of the titanium posts, and your smile will be restored. The price of dental implants can range from $1,000 to $4,000 per implant depending on the particulars of your treatment plan. The total cost will be determined by the complexity of your program, the number of dental implants needed, and other factors unique to you. We want you to be well-informed about your options, and our team will go over all the details with you in full at your initial consultation. To better serve you, we work with a wide range of dental insurance companies as well as reputable dental financing agencies. We are happy to review your payment options and help you file any claims as needed. If you would like to learn more about dental implants, we encourage you to reach out to us. Our team can provide additional information, answer your questions, or help you to schedule a consultation.